During the fourth month of the Tibetan calendar, many people refrain from killing animals and give out alms to everyone who comes asking for it. There may not be overt celebrations everywhere, but even then you can easily discern the festive spirit in the air during the Saga Dawa festival. If you are in Tibet around that time, don't forget to be a part of the huge crowd that visits the Dzongyab Lukhang Park at the foot of Potala for a late afternoon picnic. 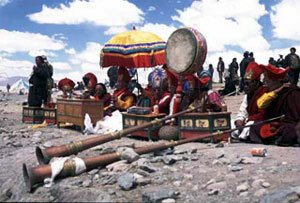 In fact, this has become some sort of a yearly ritual for the people in Tibet. 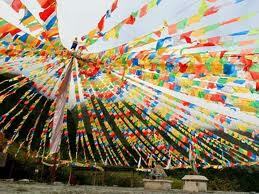 The Tarboche flagpole replacing exercise is also an interesting event that takes place during the Saga Dawa festival. 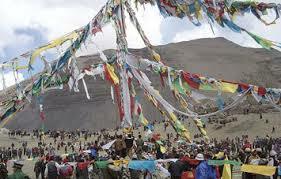 As people from all parts of Tibet gather here for this annual event, they bring small prayer flags to attach to the big flag that comes up with the combined help of the onlookers that come to witness the event. 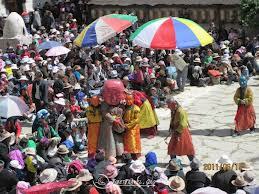 It is really fascinating to watch this event that is presided over by a Lama from the nearby monastery. The Saga Dawa festival is truly a celebration that encompasses everyone into its fold casting aside all barriers of nationality, religion or color. In fact, being a part of this holy event is such a moving experience that you come back with a deep sense of inner satisfaction that stays with you for a long time. To be a part of the Saga Dawa festival, you just need to contact us and enjoy a vacation that would be memorable in every sense. Day 01: Arrive in Kathmandu and transfor to Hotel. Day 02: Brifing and prearing visa and tours and arrangements. Day 03: Kathmandu drive to Kerung . 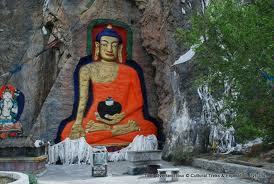 Day 04: Rest and hiking day (sightseeing Milarepa cave)-(guest house). Day 05: Kerung drive to Saga. Day 06: Saga drive to Paryang. Day 07: Paryang drive to Manasarovar Lake. Day 09: Attend to Saga Dawa festival. Day 10: Attenened to Saga Dawa festival. 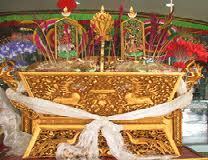 Day 11: After End of Saga Dawa festival trek to Derapung monastery. Day 12: Derapung monastery trek to Zuthulphuk Gompa via Dolmala pass. 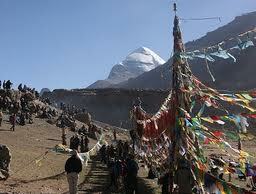 Day 13: Zuthulphuk Gompa (Milarepa cave) trek to Darchen. Day 14: Darchen drive to Horchu. Day 15: Horchu drive to Paryang. Day 16:Paryang drive to Saga. Day 17: Saga drive to Kerung. Day 18: Kerung drive Kathmandu.